Sparks shoot out from N536JB's front wheels scraping the runway surface after the tires were torn off on touchdown. JetBlue Flight 292 was a scheduled flight from Bob Hope Airport in Burbank, California to John F. Kennedy International Airport in New York City. On September 21, 2005, Captain Scott Burke executed an emergency landing in the Airbus A320-200 at Los Angeles International Airport after the nose gear jammed in an abnormal position. No one was injured. Carrying 140 passengers and six crew, the Airbus A320-232 departed Burbank at 3:17 p.m. PDT (UTC-7). The aircraft, which was built in 2002, bore the tail number N536JB and the name "Canyon Blue". It was scheduled to fly 2,465 miles (3,967 km) to John F. Kennedy International Airport. After takeoff from Burbank, the pilots realized that they could not retract the landing gear. They then flew low over Long Beach Municipal Airport (LGB) in Long Beach (the location of a JetBlue hub) to allow officials in the airport's control tower to assess the damage to its landing gear before attempting a landing. It was found that the nosewheel was rotated ninety degrees to the left, perpendicular to the direction of the fuselage. Rather than land at Long Beach Airport, the pilot-in-command made the decision that the aircraft would land at Los Angeles International Airport (LAX), in order to take advantage of its long, wide runways and modern safety equipment. The pilots flew the aircraft, which can carry up to 46,860 pounds (21,255 kg) of aviation fuel, in a figure eight pattern between Bob Hope Airport in Burbank and LAX for more than two hours in order to burn fuel and lower the risk of fire upon landing. This also served to lighten the plane, reducing potential stress on the landing gear and dramatically lowering landing speed as well. The Airbus A320 does not have the mechanical facility to dump fuel, despite various news agencies reporting that the aircraft was doing so over the ocean. Because JetBlue planes are equipped with DirecTV satellite television, passengers on Flight 292 were able to watch live news coverage of their flight while the plane circled over the Pacific for hours. The in-flight video system was turned off "well before landing." Actress Taryn Manning was on the flight on her way to New York to promote the film Hustle & Flow. Screenwriter Zach Dean was also on the plane, and while contemplating his mortality resolved to write a script about mortality (which eventually became the film Deadfall). Emergency services and fire engines were standing by on the LAX tarmac ahead of the landing. Although foam trucks were available, they were not used. The U.S. FAA no longer recommends pre-foaming runways, chiefly due to concerns that it would deplete firefighting foam supplies which might later be needed to respond to a fire; it is also difficult to determine exactly where a runway should be foamed, and pre-foaming might also reduce the effectiveness of the aircraft's brakes, potentially causing it to slide off the runway. Los Angeles Fire Dept. Battalion Chief Lou Roupoli said, "The pilot did an outstanding job. He kept the plane on its rear tires as long as he could before he brought [the nose gear down]." When the nose gear did touch down, there were sparks and flames from it, but no apparent damage to the rest of the plane. At 6:20 p.m. PDT (UTC-7), the aircraft came to a stop very close to the end of the 11,096-foot (3,382 m) runway 25L. In an attempt to keep the nose gear off the ground as long as possible, reverse thrust was not used to slow the aircraft. The pilots therefore used a much larger portion of the available runway than in a typical landing, stopping 1,000 feet (300 m) before the end of the runway, validating the decision to divert from Long Beach, where the longest runway is 10,000 feet (3,000 m). Passengers began to disembark less than seven minutes later. The landing was smooth and no physical injuries were reported. The aircraft was evacuated via airstairs, as opposed to Evacuation Slides typically used in an emergency situation. As JetBlue did not operate from LAX at the time, the aircraft was towed to a Continental Airlines hangar at LAX for evaluation. Expert opinion expressed was that, despite the drama and live worldwide coverage, there was little real danger to the passengers or crew of Flight 292. The A320, like all modern airliners, is engineered to tolerate certain failures, and, if necessary, can be landed without the nose gear at all. The media reported that this was at least the seventh occurrence of an Airbus A320 series aircraft touching down with the landing gear locked ninety degrees out of position, and one of at least sixty-seven "nose wheel failures" on A319, A320 and A321 aircraft worldwide since 1989. Earlier incidents included another JetBlue flight bound for New York City, a United Airlines flight into Chicago, and an America West flight into Columbus, Ohio. While some incidents were traced to faulty maintenance and denied as a design flaw by Airbus Industries, the manufacturer had issued maintenance advisories to A320 owners which were later mandated as Airworthiness Directives by American and French aviation authorities. Messier-Dowty, which manufactures nose gear assemblies for the A320, stated in an NTSB report in 2004 that part of the gear had been redesigned to prevent future problems, but at the time the redesign was awaiting approval. Mechanics familiar with this common fault usually replace or reprogram the Brake Steering Control Unit (BSCU) computer. The NTSB report says that worn-out seals were to blame for the malfunction, and that the BSCU system contributed to the problem. The NTSB reported that Airbus had since upgraded the system to take care of the problem. Following the incident, the aircraft was repaired and returned to service still bearing the name "Canyon Blue." The flight route designation for JetBlue's flights from Burbank to New York was changed from 292 to 358 (the other direction became 359). ^ "7 Airbus Jets Had Landing Gear Trouble". latimes. ^ "FAA Registry (N536JB)". Federal Aviation Administration. 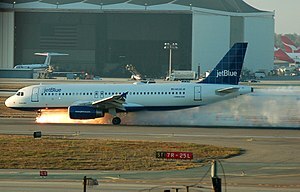 ^ "JetBlue Flight Lands Safely". Fox News. September 22, 2005. ^ "Emergency landing televised on flight - US news - Life - NBC News". msnbc.com. ^ Morin, Monte; Stuart Pfeifer; Megan Garvey (September 22, 2003). "Disabled Airliner Creates a 3-Hour Drama in Skies". Los Angeles Times. Retrieved August 5, 2008. ^ a b "Even passengers watch plane's drama on TV". The Seattle Times. September 22, 2005. Archived from the original on February 2, 2013. Retrieved December 16, 2012. ^ "Taryn Manning recalls JetBlue scare". TODAY.com. ^ Steven Zeitchik (March 24, 2010). "An in-flight scare leads to a buzz script on the ground". 24 Frames (Los Angeles Times). Retrieved December 25, 2015. ^ "CertAlert No. 02-04" (RTF). FAA. 2002. Retrieved April 2, 2007. ^ Oldham, Jennifer; Garvey, Megan (September 23, 2005). "7 Airbus Jets Had Landing Gear Trouble". Los Angeles Times. Retrieved December 12, 2012. ^ a b "Great Video, But Little Danger in Emergency Jet Landing". ^ Broder, John M.; Wald, Matthew L. (September 23, 2005). "Earlier Landing Gear Problems in Airbus Jets". The New York Times. Retrieved May 6, 2010. ^ Art Marroquin, Staff Writer (November 29, 2008). "Worn-out seals blamed in 2005 JetBlue landing". ContraCostaTimes.com. Archived from the original on September 25, 2013.